Time for shameless self-promotion, because no shame is warranted! Also because it’s radiothon time on 3CR, and we need your donations to keep us on the air. WHEN it comes to chocolate, kids will eat it – even if it’s the dark variety. It won’t make them fat, but the jury is out on whether a daily dose of the sweet stuff is the best medicine for their heart health. 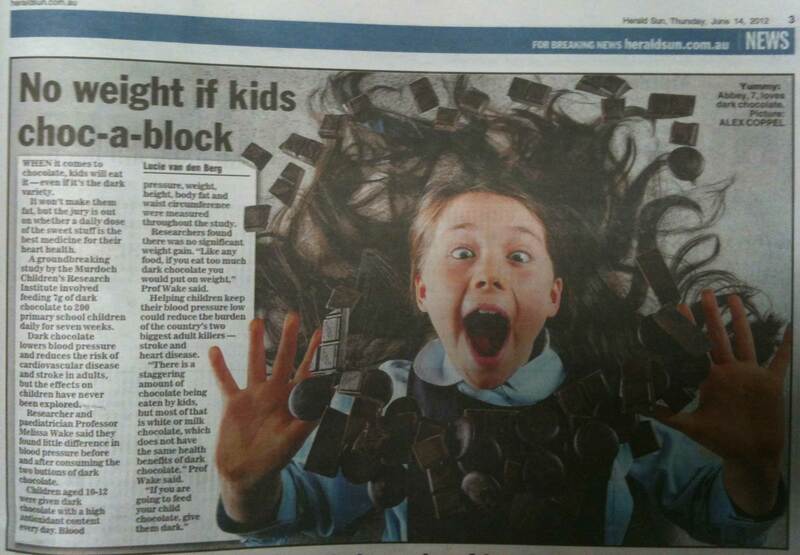 This article is about a recent study from the Murdoch Childrens Research Institute, where they gave children 7 grams of dark chocolate per day for 7 weeks, to see if it lowered their blood pressure in the same way as it does for adults. It turned out the chocolate didn’t affect their blood pressure, but it also didn’t have any negative effects, like weight gain. Hence the headline, the claim “it won’t make them fat” and the photograph of a happy child buried in chocolate. Researchers found there was no significant weight gain. “Like any food, if you eat too much dark chocolate you put on weight,” Prof Wake said. Just as well I read that far, because until then I had the impression kids could eat as much as they want and never get fat. Now maybe this doesn’t matter and maybe parents have enough sense not to believe wild claims in the Herald Sun, but maybe it’s also making scientific research sound wild and unreliable too. Which is why we need good, alternative science news like you get on Lost in Science on 3CR, and why you should support independent media. Radiothon runs from 4 to 17 June 2012, so head on over to www.3cr.org.au and donate online, or call 03 9419 8377. And to find out more about chocolate and kids, read the media release from the Murdoch Childrens Research Institute, or see the original article, Chan EK, Quach J, Mensah FK, Sung V, Cheung M & Wake M 2012, “Dark chocolate for children’s blood pressure: randomised trial”, Archives of Disease in Childhood, published online 9 June 2012, doi:10.1136/archdischild-2011-301305. 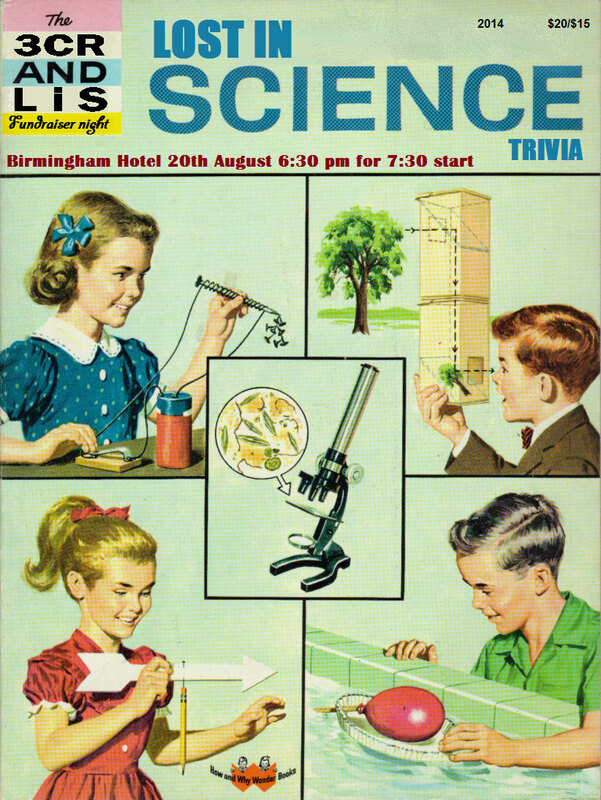 We’ve been a bit quiet recently on the Lost in Science blog. But that doesn’t mean the team hasn’t been busy, oh no! Here are some links to go with our recent radio broadcasts. Or, you can download the podcasts, for our shows from 3 November 2011 (25:54 min / 12 MB) and 10 November 2011 (28:09 min / 26 MB). Analysis of corporate ownership networks shows that out of 43,060 transnational companies, only 147 of them – mostly banks – control 40% of the wealth. Read more in New Scientist, or see the entire paper in the arXiv database. Protesting about this risks exposure to pepper spray, or Oleoresin Capsicum, which uses the chemical capsaicin ((CH3)2CHCH=CH(CH2)4CONHCH2C6H3-4-(OH)-3-(OCH3)), extracted from chilli peppers, to cause eye and skin irritation. Read about its health effects in Investigative Opthalmology and Visual Science and the North Carolina Medical Journal, or see treatment recommendations from Melbourne’s Royal Children’s Hospital. The Berkeley Earth Surface Temperature study, partly composed of and funded by climate change sceptics, has performed a massive re-analysis of global land temperature records and verified that yes, the world really is warming. Aside from being real, climate change seems to have caused Australian seaweed species to move between 50 and 200 km south, risking the habitat of many other species that depend on them. Read more at ABC Science, or see the paper in Current Biology. In more extinction news, Tasmanian devils are currently threatened by a contagious cancer, which seems to spread due to their genetic similarity. Hope is held for a small, genetically different and mostly disease-free population in the northwest of the state, research into which has won a team of scientists the 2011 Eureka Prize for Environmental Research (also see their paper in Conservation Biology). Although the recent discovery of devils with facial tumour disease in even that remote area has increased concern for this unique species. Speaking of genetic diversity, research on the Sandy Island mouse has shown that polygamous females produce more viable embryos. See the paper in Ecology Letters, or read more at the University of Western Australia. Finally, to space. Three recent discoveries have shed new light on how solar systems like ours form: there’s a planet called LkCa 15b, 473 light years away, which has been discovered in the process of forming; water seen in the planet-forming disk around the young star TW Hydrae (175 light years away) supports the theory that it collects around grains of dust to make comets, which then deposit the water on planets like Earth; and photos of the asteroid Lutetia, taken by the European Space Agency’s Rosetta probe, suggest that, at around 3.6 billion years old it’s a relic of the early Solar System, and have given clues to its formation. Have you missed any other shows? Catch up on our old episodes! Lost in Science is much more than a great blog, it’s also a fantastic radio program. We’re distributed nationally on the Community Radio Network, but our home station is 3CR in Melbourne, 855 on the AM dial. And like all community radio, 3CR relies on donations and subscriptions to keep going. Which is where radiothon comes in: from 6-19 June we’re rattling the tin and asking for your support. If you live in Melbourne, tune in to 855 AM this Thursday 16 June at 8.30 am to hear our live radiothon show. Or, you can help us out now! Call 9419 8377 or donate online.